London (AFP) - The dollar sank Wednesday with a fresh crisis in the White House fuelling concerns that Donald Trump's economy-boosting agenda could be run off-track. Stock markets also fell as the administration was once again rocked by allegations over its links to Russia after it was reported Trump had divulged classified information to the nation's foreign minister. That was followed late Tuesday by reported claims that Trump pressed recently-fired FBI boss James Comey to drop a probe into ex-national security advisor Michael Flynn over his links to Moscow. "Equity indices are on the back foot again as investors digest the latest real-life episode of House of Cards," said Mike van Dulken, head of research at Accendo Markets, in reference to a popular US political TV series. The latest events are "slowly sapping faith in stimulus policies getting even partisan approval", he said. The uncertainty hit stock markets, with the Dow slumping 1.2 percent in late morning trading. In Europe, Paris stocks tumbled 1.6 percent and Frankfurt shed 1.4 percent. 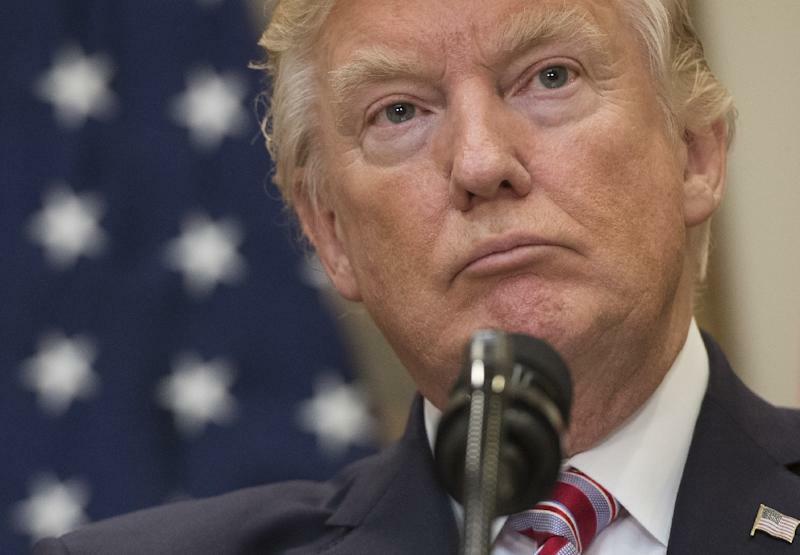 While the Oval Office has furiously denied any wrongdoing, there is a growing sense of crisis that even raised questions over a possible impeachment, throwing into doubt Trump's plans for tax cuts, big spending and red-tape slashing. Bets that the plan would fire the economy helped fan a dollar and global equities rally in the months after Trump's election. "Markets aren’t feeling too peachy about impeachment. Calls for President Trump to be impeached are growing louder and that has created a long overdue sense of fear in markets," said market analyst Jasper Lawler at London Capital Group. While impeachment remains a remote possibility for the moment, if Trump's "focus is on clearing his name, it isn’t on his agenda of tax cuts, infrastructure spending and deregulation. Trump getting any market-friendly legislation passed anytime soon seems pretty remote." The dollar took a beating, as the euro broke above $1.11 to levels not seen since Trump's election win in November, while the yen was also piling pressure on the US unit. The dollar bought fewer than 112 yen, well down from recent peaks above 114 yen seen last week. London did slightly better than its eurozone peers on the back of figures showing that Britain's unemployment rate had fallen to a 32-year low, but economists worried about slow wage growth. The FTSE ended the day with a loss of 0.3 percent. The market was helped by banking giant Lloyds, which climbed two percent after announcing it had returned to full private ownership following its government bail-out at the height of the financial crisis. In Asia, Tokyo ended down 0.5 percent as the stronger yen hit exporters, while Hong Kong gave up 0.2 percent by the finish and Shanghai closed 0.3 percent lower. Gold, a safe-haven investment, rose by nearly two percent in the European afternoon.